Though Thiruputkuzhi at Kancheepuram is considered as Jatayu Mokshaa kshetram , as per Srimad Valmeekee Ramayanam , Taket near Nasik is considered as the holy place where Lord Rama met the great devotee Jatayu . This Holy Dhaam is about 65 kms from Nasik on Igatpuri Road in Mumbai Highway road . Igatpuri is in Daudhra village, Maharashtra, which is about 45 kms from Nashik .A slight diversion from the Highway has to be taken to reach this village. This is the place where the devotee vulture, Jatayu Maharaj fought valiantly with the demon Ravana with the intention of rescuing Mother Sitadevi and gave his life at the lotus feet of Lord Sri Rama. 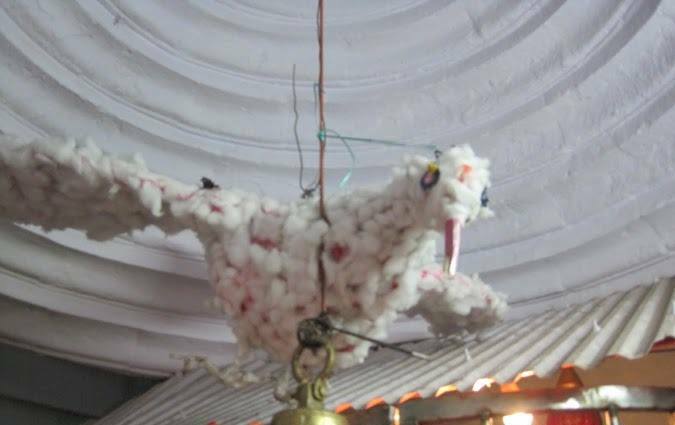 In this holy place , a replica of the vulture made from cotton is hung at the temple entrance . A priest recapitulated all the incidents – how Maharaj Jatayu fought valiantly with the demon Ravana, and left his body in the arms of Lord Sri Rama informing the whereabouts of Loka Matha Sita . The water level in Prayag pond always remains the same at all times., A tree under where Loka matha Sitadevi was observing the valiant fight between Jatayu and Ravana can be seen. 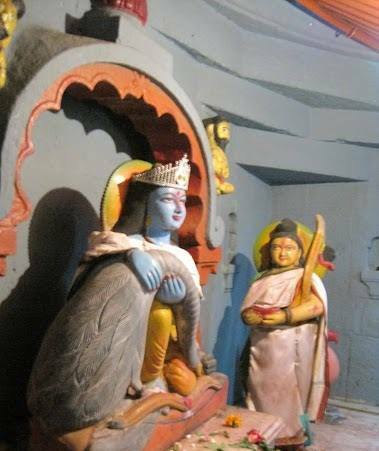 Lord Rama consoles Jatayu who informs about Sitadevi’s abduction before breathing his last. Srirama blesses Jatayu by sending him to Paramapadam while Lakshmana looks on . Lord Rama performs the last rites to the bird devotee for 13 days. Even Dasaratha did not get this fortune as he could perform only Jala tharpanam at Chitakoot. There is another Divyadesam which is connected to Jatayu. 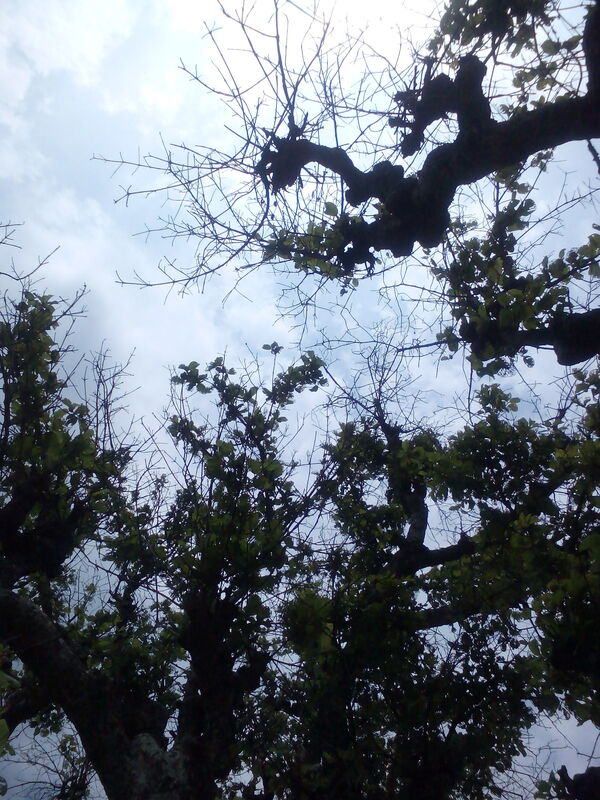 Thiruputkuzhi is located 12kms west of Kanchipuram . It is the most sought vaishnava divya desam of Sri Vijaya Raaghava Perumal temple as it relates to the episode of Jataayu Moksham in the Srimad Raamaayana. Another importance of this place Swami Raamaanuja learnt the advaitha lessons from Yaadava Prakaasar . 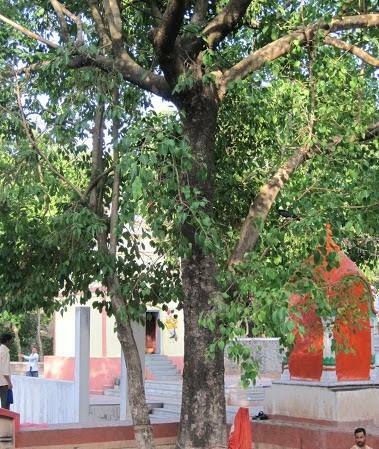 The mandapam where he learnt his lessons still exist here. A unique feature of this temple is Sri Vijaya Raaghava Perumal is seen in a sitting posture, having the bird (Jataayu) on his thigh. Not able to bear the grief caused by the final rites of the cremation of Jaatayu, Sri Devi Thaayar is said to have moved to the other side . Lord Rama had got ready to perform the final obsequies on the banks of a pond (now known as Jatayu Pushkarini) when he realized that the Vedic ceremony needed the presence of his wife. He felt sad that he was helpless in the matter. 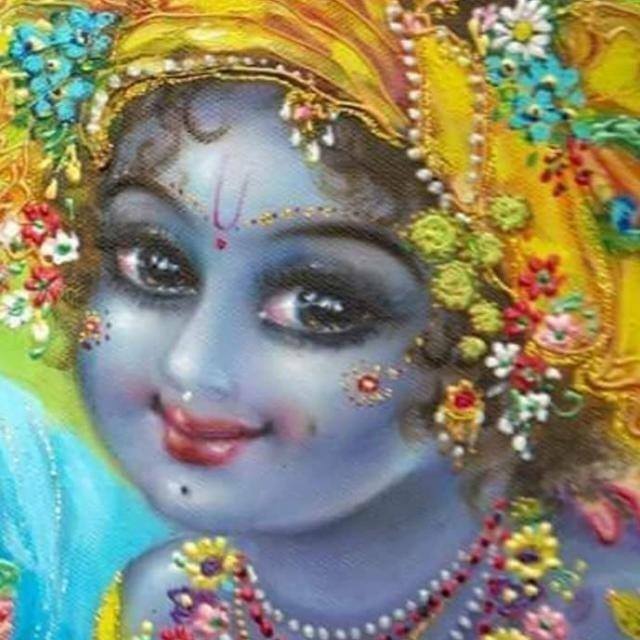 Immediately there arose a golden lotus in the tank with Bhuma Devi (Sita is considered to be a manifestation of Mother Earth) who helped fulfil Rama’s desire to complete the rituals. Hence we find Bhuma Devi in the sanctum. She is seated, with a lotus in hand. At this temple, the Goddess is seen to the left of the Lord Vijayaraghava with her head slightly turned in the Lord’s direction (in all Divya Desams, Sri Devi Thaayar is seen to the right of the Lord). Also, the Thaayar Sannidhi is to the left of the Lord. 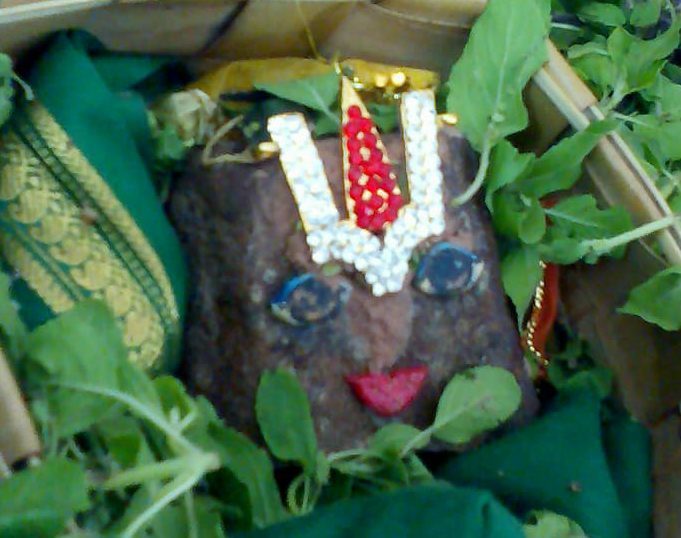 The ( Ashwa )Kutharai Vahaanam is a special attraction at this temple . On few festive occasions, Lord Vijaya Raaghavan goes on street processions mounted on his ‘Horse Vaahanam’ which looks like a real Horse, (with its jumping stride and movements). The devotee created this horse specifically for Lord Vijaya Raaghava was asked to make another horse. He refused to recreate his magic for anyone other than the Lord . As a mark of blessing during Ashwa Vahaanam ( Horse ) Lord marches into the street where this devotee lived . The Priest (Koil Bhattar) was kind to explain the vaibhavam of the temple during our recent pilgrimage yatrai. Few devotees also say that It was Pullambothangudi which is five km from Swamimalai, in Thanjavur district was the place where Jatayu got Moksham. Both the holy places bring tears to the pilgrims for the great kainkaryam a Bird could do .Jai Jatayu Maharajki …..
Jai Jai Jai SreeRam ..
Jay ! Jatayu Maharaj ki jai ho ! Thanks for sharing the story of Jatayu Moksha kshetram. 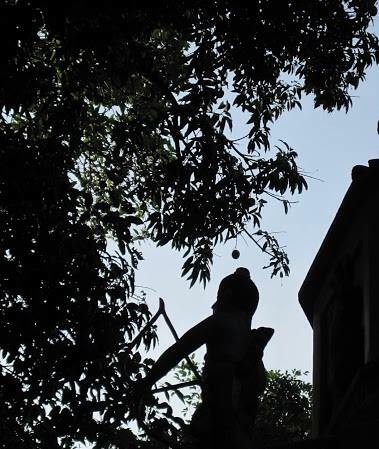 Jadayu Moksham teaches us Goden Lessons to observe as a Human Being, When a Bird Devotee could reach to that much height! Varadan, to me you seem to have touches of Tirumangai Alwar to visit so many Holy spots & to give details with so much accuracy & Devotion! May Alwar bestow many many more years of life to your goodself to continue your Service! Adiyen – Ramanuja Dasan- Jai Sriman Narayana!